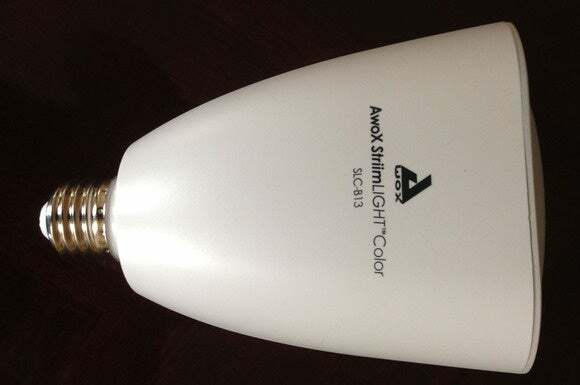 The Striimlight Color ($100) comes with a physical remote control in addition to the downloadable Smart Control app. The remote lets you turn the light on and off, control or mute the sound, change the light’s color, vary its white color temperature, and flash or pulse the light. At full strength, the Striimlight is nice and bright: 420 lumens. The Striimlight actually sounds pretty good, with a lot of detail in the music. It doesn’t have a lot of bass, but the overall balance is pleasant, and it can get plenty loud. The quality is about the level of a good mono tabletop radio and is clear and detailed enough that you could listen to it for an extended period without your ears getting tired. Simply playing music through the speaker and turning the light on and off was straightforward, but using the more elaborate controls, whether through the app or the remote, was more of a challenge. The app’s home screen lists any connected compatible devices, along with icons for quickly accessing all your devices or any group you’ve defined. The Striimlight delivers good sound and bright light. But my Striimlight was not always visible on the home screen, even though I was connected via Bluetooth and able to play music. If I switched to another app for a while and then switched back, the Striimlight icon might appear—or it might not. Once it showed up and I connected, it stayed that way, but I was never able to count on seeing it. Once connected, the app provides an extensive set of options. Icons along the bottom give access to White, Color, Music, and Alarm settings. The White screen gives a choice of color temperature for white light. 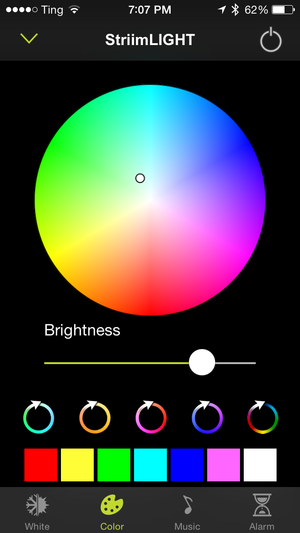 Color provides a color picker along with preselected options. Alarm lets you set a time for the light to go on. Awox's very good hardware deserves better than the crappy software that comes with it. But the Music icon didn’t give me anything I could use. It offered a Play/Pause button, but the only song listed was “Label” by Label (to be clear, not a real song I own), and trying to play it crashed the app. There’s a little disco ball icon that supposedly lets you the light vary in time to the music, but since I couldn’t find music to play, it didn’t work. The remote is handy but also confusing. 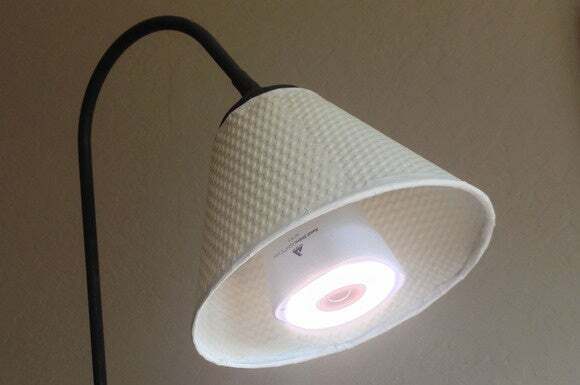 If you use it to change the light’s color, there’s no obvious way to make it white again. It turns out that two of the buttons control the white color temperature, and they’ll do the trick, but I had to have a company representative explain that to me. (The fact that both of them have plus signs next to them, even though one of them is supposed to lower the temperature, didn’t help.) Once I figured everything out, though, I did appreciate the convenience of a separate remote that meant I didn’t have to unlock my phone and switch to an app just to dim the light. The Striimlight Color sounds good and delivers a wealth of luminary options, but the various ways of controlling it need improvement (fortunately for the manufacturer, software is easier to fix than hardware).